This section presents Bible Studies on various subjects and answers many questions many have concerning what the Bible teaches. 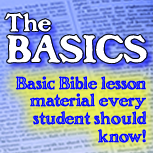 A Bible lesson will be added several times a week and its link will be included with the Daily View e-mail. 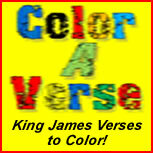 Sign-up and have a Bible Answer and the New Testament Daily View devotional sent to you each day. When a person is saved, he becomes a different, “new” man. One may be “new” on the inside, but all have the same “flesh” they were born with. Those fleshly, worldly desires may be tucked away out of sight forawhile, but he will always be waiting for his chance to make an appearance. The "old, worldly man" is still alive and available. If the indwelling “new man” does not keep him in check, the will again ruin one's life and cause him to be in the same miserable state, or worse, than he was in before. No, one does not get unsaved because he does not follow the “new,” Holy Spirit’s guidance. However, his life may not appear much different than an unsaved person. He will not have the joy he could have had, and he will not be all he could have been. He will go through many hardships that he would not normally go through, and God will not use that person the way He desires. All have to battle the pull from the old nature’s stranglehold to rule and get its way. Many of our personal and social problems are because someone’s “old man” is trying to rule the roost — again. It is that old man that is prevailing when the green-eyed monster of jealousy raises its unruly head between brother and sister, or when one gets angry quickly with another. He surfaces again when a lie is offered to get one out of trouble. It is the “old man” that creates power struggles between peers, becomes selfish, and it is that same villain that spreads gossip to defame one’s testimony, because someone hurt the gossiper’s feelings. The “old man” exposes himself when a mouth spews out hurtful words and filthy talk. The old nature gets control again when we allow it to criticize someone that is not doing something our way, or when we are scared others are not accepting us, and other countless ways. The “old man” will always haunt our lives, until we do what God commands we do to our old, could-be-dominating nature. Our “old man” must die — sometimes even daily, but he must die! The “old man” should not be allowed to have control of our lives. No, do not even suggest one committing sin and taking one’s life. That is definitely letting the “old man” have his lecherous control on one’s life. That is not how to get rid of the "old man." When one is saved, he is a new, different person with new needs, desires, and purpose. His second “birth” creates in him a new part of him that never existed before. “For in Christ Jesus neither circumcision availeth any thing, nor uncircumcision, but a new creature.” Galatians 6:15 Religious ceremonies, traditions, and works should not be the governing factor in one’s life, but a new, spiritual life in accordance with God’s Word should be guiding him. Do not live for “self.” Let the “new man” in you be your life’s leader. Put self-ambition, self-goals, and self-desires behind you and let your leading force be the desire to be obedient and to be a testimony of God’s commands found in His Word. Listen to the indwelling Holy Spirit. Let much of your self-motivated desires “die.” In so doing, God will live through you. The “new man” has a new mind, new spirit, new master, new goal and a new joy. All are given to a believer when he trusts and obeys God. Let your "old man" die. Self-will will have less dominance when the “new man” is leading and the one making decisions. Do not let worldly desires and habits rule and reign in your life. Being born-again is being born into the family of God. What kind of child are you that, while a member of one family, act and wish you were a member of another family? That is what those that are living for the world by living the world’s way are doing. By their actions, they are telling God, “I love you Father, BUT I like how the unsaved live; and I will behave, have the same goals, and strive to be like them.” That is what Christians do to their own Creator! We are on the winning side; why would anyone ever want to act and live like those on the losing side? You are not your own anymore, if you are saved. “I’m born again, but I don’t want to do all God wants me to do,” is what too many say by their actions and words. You are not your own, you are purchased by God when you are saved. You are purchased by the blood that Christ shed on the cross. You did not like how you were before and how you were headed to hell, claim many when they got saved. He has done great things for you, including rescuing you from an eternal hell. Don’t you want to do something for Him? Live the life He wants you to live! If all the children of God would obey the "new Man," and let their "old man" "die," their lives would be much different. There would be few disagreements, tensions, and disunity in churches, famililies, schools, and even the workplace. All would have the same godly purpose and direction, when the "new" creature guides them through life. If you want the "new" life God desires you to have, let your "old man" die — and please, don't ever let him be resurrected! 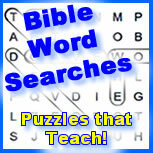 Interested in reading more Bible studies?